Alfreton Town Football Club have purchased the freehold to their Impact Arena ground. The move was concluded this week following lengthy negotiations with Amber Valley Borough Council. Chairman Wayne Bradley said: “It is with delight and satisfaction that I am able to confirm the conclusion of the freehold purchase of the club’s home, the Impact Arena” said Bradley. “The purchase has been made from the previous landlords, Amber Valley Borough Council, and I would like to thank all parties from the borough who helped with making the purchase a smooth and trouble free transaction. “A significant, but reasonable and acceptable figure was agreed for the purchase of the land which will be registered in the name of the football club. “The acquisition of the club’s home will add very important security and greatly help with any applications for future grant aid to assist in the development of the current facilities” ended Bradley. On Saturday the Reds will be looking to continue their recent on-field progress when they travel for another important relegation six-pointer at second-from-bottom Dartford. 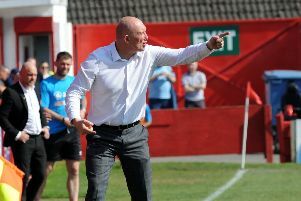 Alfreton have yet to take a point from Princes Park after suffering defeat in two previous trips but they will travel in the knowledge that they recently picked up a first ever win at AFC Telford United in similar circumstances. Manager Nicky Law will be without on-loan Plymouth Argyle defender Aaron Bentley who is ruled out with a ‘deadleg’ and the Reds boss will need a late check on the fitness of defender Bradley Wood who was forced into an early exit in the 2-0 home win over Kidderminster Harriers last Saturday with injuries to an ankle and shin bone. ATFC Supporters’ Association transport for Saturday’s game at Dartford departs at 8.45am and seats can be booked by contacting Mark Thorpe on 07857 558401 as soon as possible. Meanwhile, Alfreton Town FC have announced that admission prices for the forthcoming Vanarama Conference home game against Lincoln City on Tuesday, March 17th, have been reduced to just £10 each for adults and concessions. The price applies to both home and away fans for the fixture which has a 7.45pm kick-off. The juniors entry price of £2 for children aged 15 and under, provided that they are accompanied through the turnstile by a paying adult, remains the same.